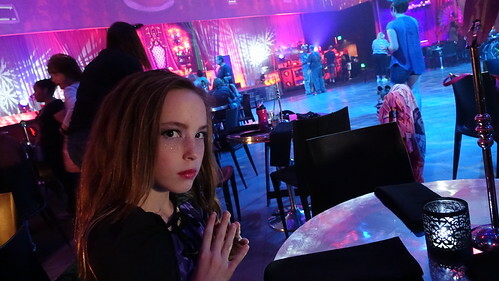 My daughter and I visited Club Villain recently and I figured I’d write a post explaining the full experience with details, photos and videos to help you decide if it’s for you. Is t his event acceptable for children? I’d say yes! My 12 year old had a blast. While we only saw a dozen or so children, likely due to all the blogs saying it’s an adult event, each seemed to be enjoying themselves. Is it all you care to eat? Yes, you may visit the buffet as many times as you like. 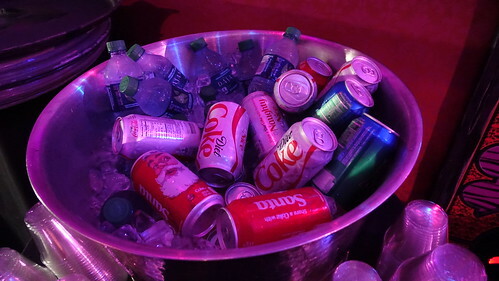 Is it all you care to drink? Yes, you may visit the bar often, but they will stop serving you if you appear impaired. I didn’t observe a wild party going on, just adults partaking in themed drinks and meet and greets. Is Photopass included? 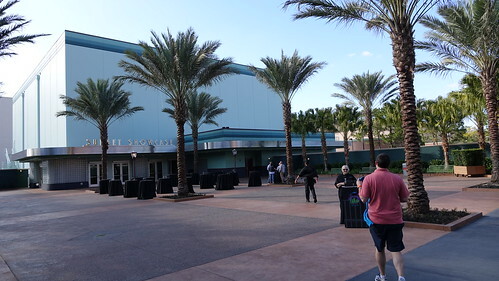 Yes, Photopass photographers are each meet and greet station ready to take your photo. 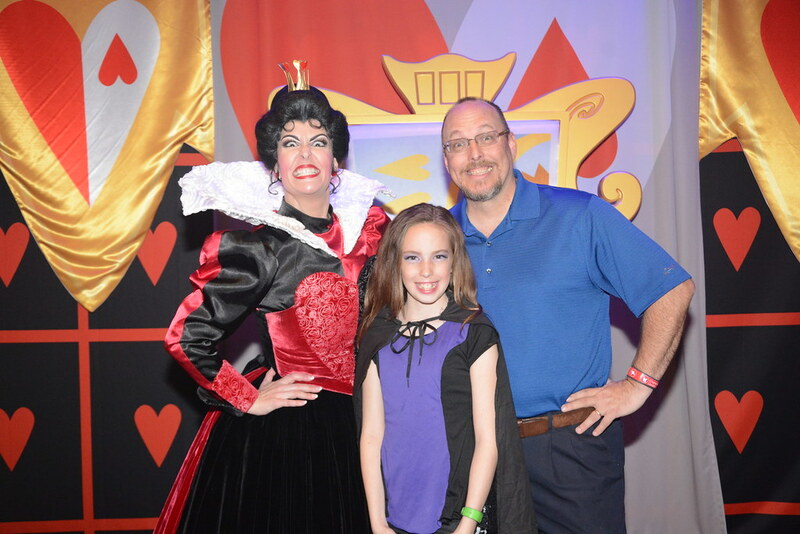 Downloads are complimentary from disneyphotopass.com website after the event. You can even use the Disney app from your phone. You do not need Memory Maker for this experience, but it’s added to your same Photopass account. Do the characters offer meet and greets or only dancing? 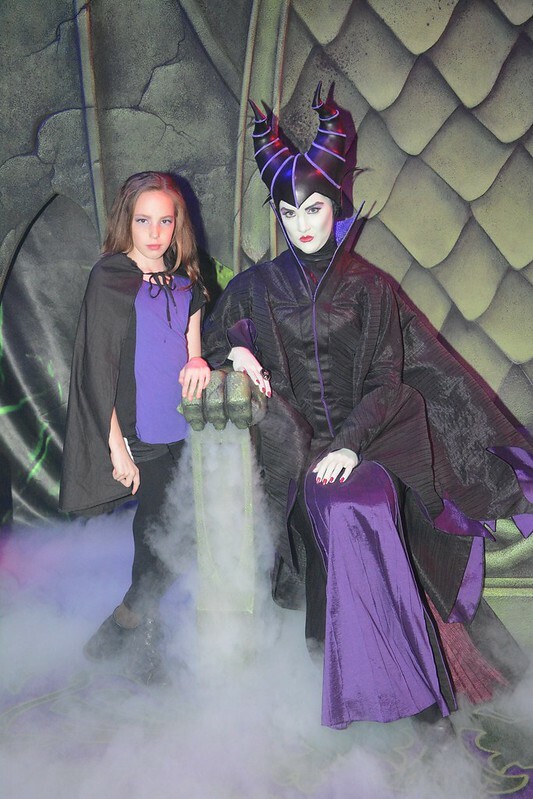 Each female villain offers an actual meet and greet. Getting a photo with Dr. Facilier can be more tricky as he comes and goes constantly. Many have had success by waiting until most guests have left. 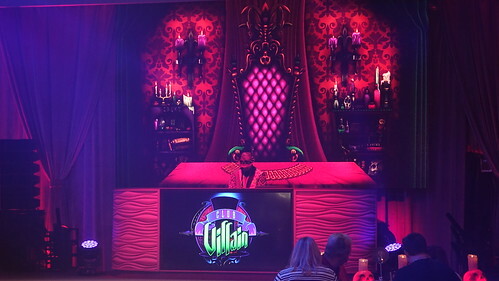 Club Villain is a special dining experience that is currently offering at the Sunset Showcase in Disney’s Hollywood Studios. Currently the special event costs $129 per person and requires advanced registration. Children and adults are welcomed. 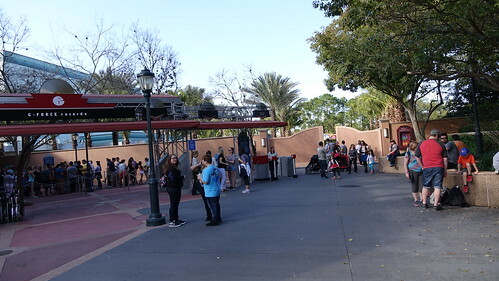 You’ll find the location through these gates next to Rock n Roller Coaster. A small sign on the right of the gate points you to the gate, or is it the roller coaster? 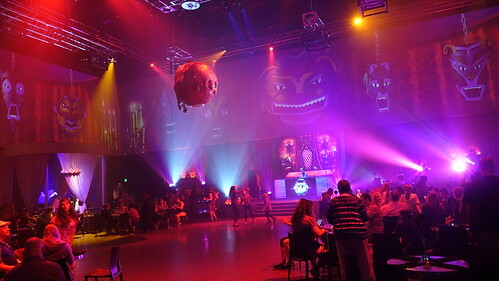 Sunset Showcase was created as a multiple purpose building and briefly held a daytime dance party known as Club Disney with Mickey, Minnie and the gang. It isn’t being offered at this time. You will stop by this small check in stand. Ladies will find your name on the list and present you with your special invitation. 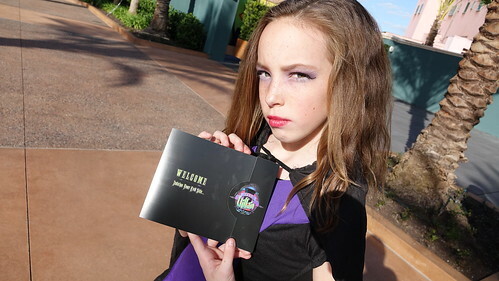 Heres’s a copy of the invitation outside by our villainous model. Inside of the card has pre-printed autographs and a full menu which features a sauteed station, a carving station and a cast iron station. You can click the photo for a full look at the menu. 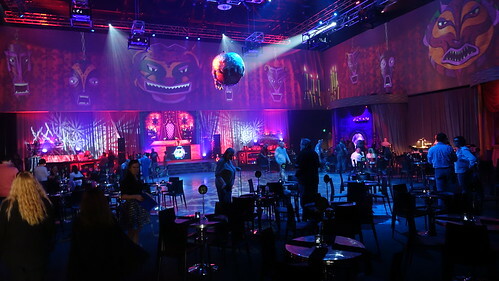 Inside the building has been totally transformed into a villains lair or club for villains to hang out and run elbows with us common folk. I must say, it appears that Disney didn’t spare any expense making the place look amazing. Only thing we disliked about the decor was the small tables. We were paired up with a nice couple here for the runDisney event and it was quite cramped with just 4 little plates and a drink each. 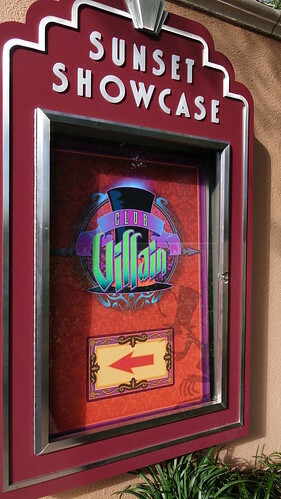 Each villain has a specific, well-themed meet and greet area. 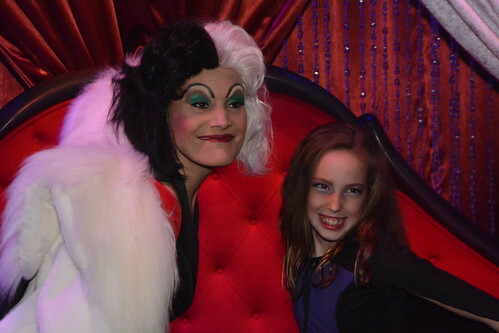 If you arrive early or visit them between villain sets, you can have your photo taken with them. 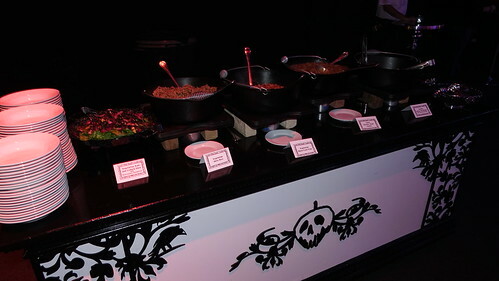 Each theme was very detailed and my daughter loved them. Her inner villain. She loves her puppy, but couldn’t ever turn it into a coat. 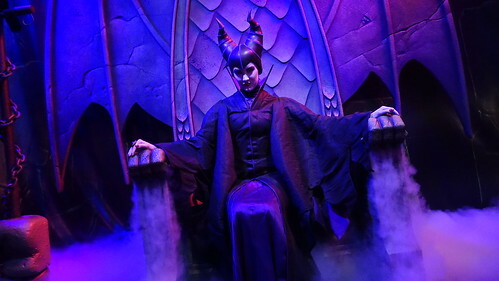 Maleficent’s set was really awesome too. 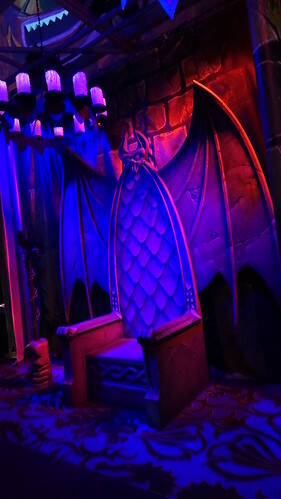 It looked like a giant bat throne and made for great, low-light photos. Photos with most cameras would come out better with the flash turned on. 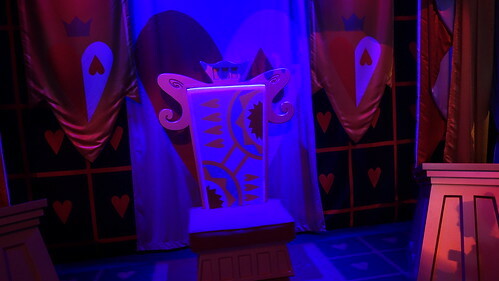 Queen of Hearts has a special Wonderland themed throne area. Snow Queen / Queen Grimhilde / Evil Queen / the Queen has a very detailed set with the mirror, heart box and peacock throne. Look at how much detail is in just the top of the throne alone. 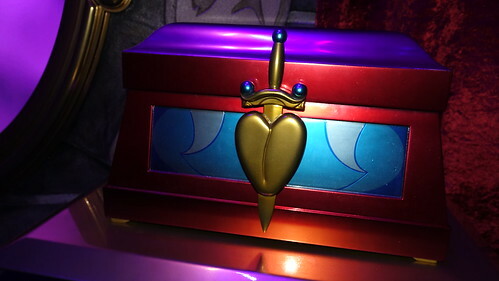 Heart chest looks great too. Future Queen upon her throne. 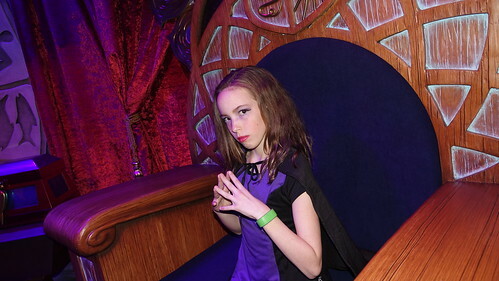 She said all the CM’s were calling her Princess as she entered, but she is a villain. I told her she can’t become a Queen, unless she is a Princess. Magic Mirror on the Wall appears and disappears, but doesn’t speak. Still a cool feature. 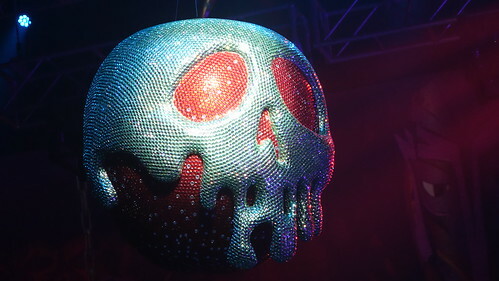 Love the apple that is the disco ball for the theater. DJ has a sweet set up. 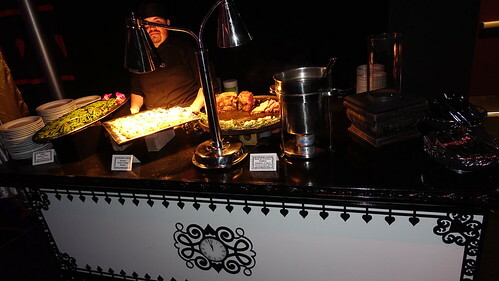 Club Villain offers a buffet of New Orleans inspired dishes. Pig wings and dirty rice are delicious and the food isn’t as spicy as you’d expect Creole food to be. You may enjoy as much as your heart delights, but trying to work in the 4 meet and greets, dance time and food in 2 hours can be a bit rushed. 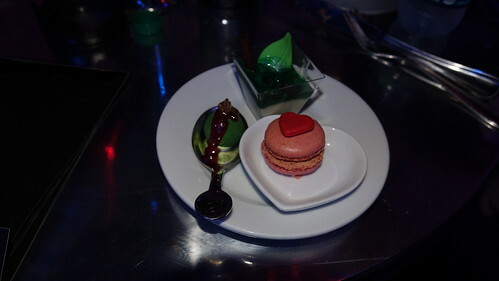 Desserts are each themed to the different villain they represent. 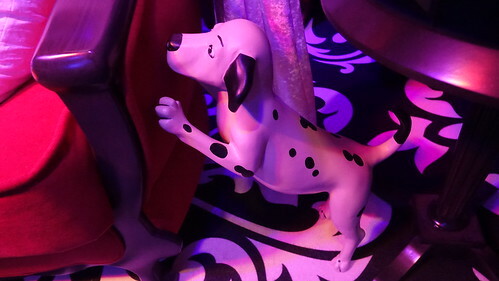 Each is quite tasty and really adorable in theming. 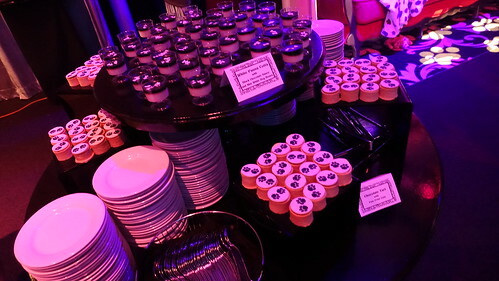 You almost wish you could frame the little desserts and take them home. 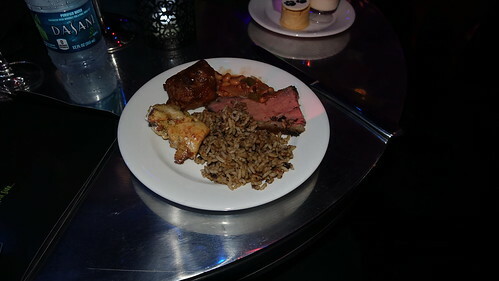 Some of the buffet foods. Desserts. See the Cruella theme in the 2 nearest you? Queen Grimhilde and Queen of Hearts themed desserts. 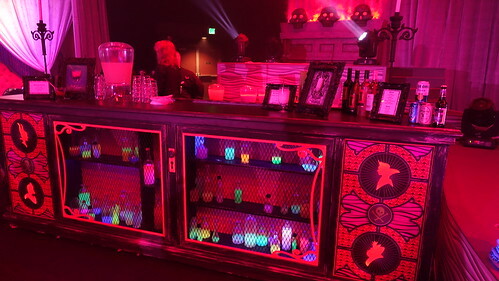 A full bar is available for those who wish to imbibe. 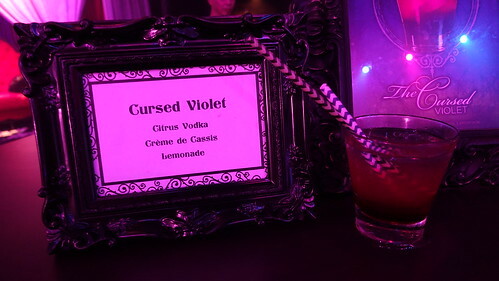 A variety of themed drinks is available. 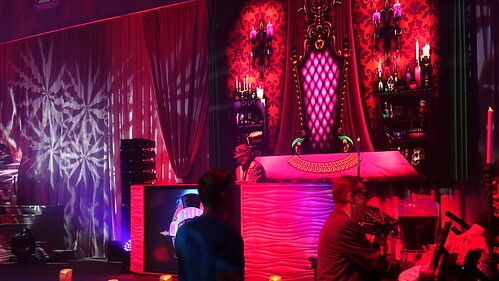 Club Villain offers a host/singer, Dr. Facilier, a DJ and a couple of dancers. 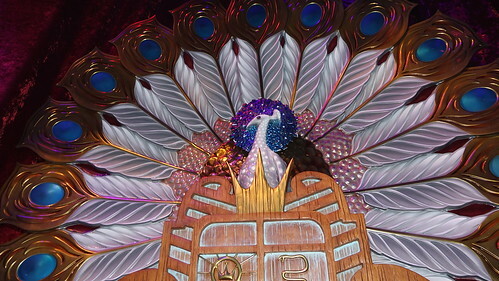 I loved the host’s jacket! 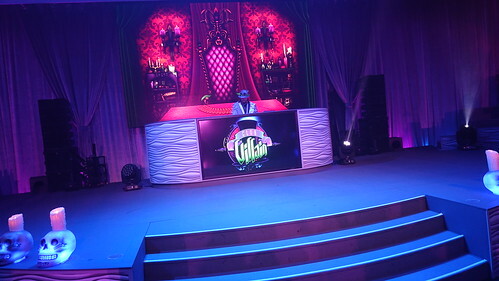 Must be a dream job for a DJ to have a booth with a villain theme. 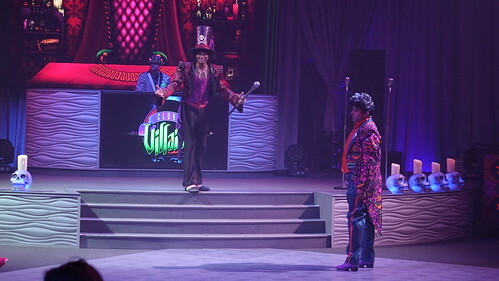 Host introduces Dr. Facilier and dancers. Unfortunately, we couldn’t hear any of Dr. Faciler’s entrance due to technical issues. Just before he introduced the lady villains, they brought him a handheld microphone. Joined by Queen of Hearts and Cruella, the other ladies prance about in their formal presentation. 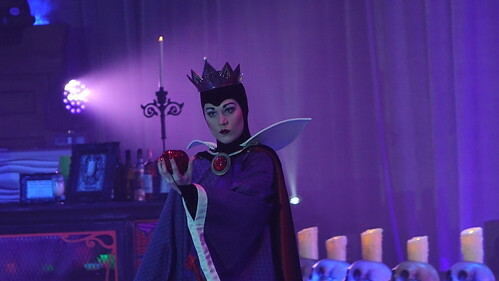 Hey, can you put that poison apple away please? 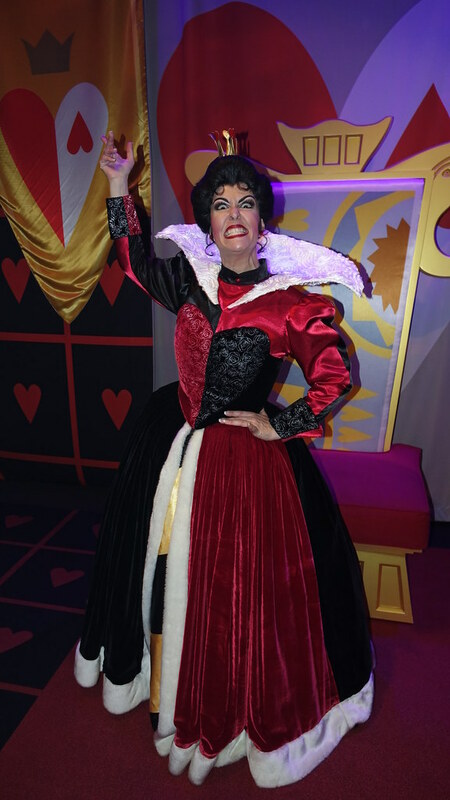 Queen of Hearts was the star of the night for us. She was very in character and got to show a really fun side. Dancers were sweet enough to pose for a photo with my daughter, but it was blurry due to all the haze in the room. 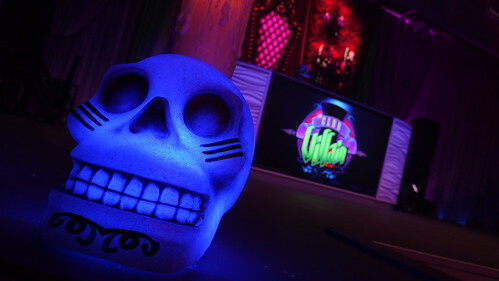 You’ll notice in the videos below that the intro has a similar vibe to the old Villains mix and mingle at Mickey’s Not So Scary Halloween Party. 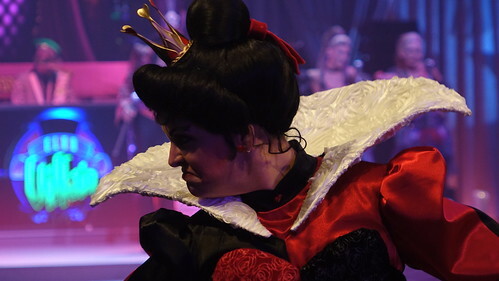 Villains reappear a couple of times in entertainment. Once is a type of line dance and the other is the New Orleans style parade around the room. You’ll even receive some beads! 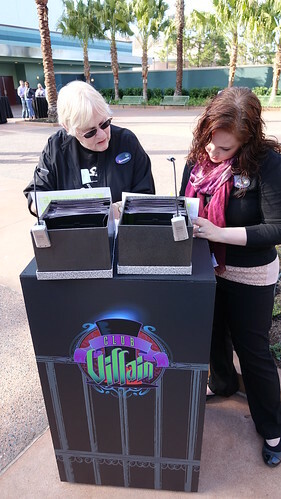 Each villain has an actual meet and greet station. You are given an assigned time to meet them on back of your invitation given you at check-in. Some CMs checked it religiously and others didn’t seem to care much. 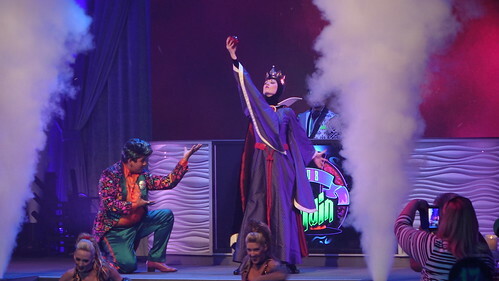 Each villain offers 2 sets of meet and greets, that’s why they give assigned times. How awesome is that throne? I think I’ll build one for my living room. I did the first couple of photos with no flash to demonstrate the feeling you have in the area. 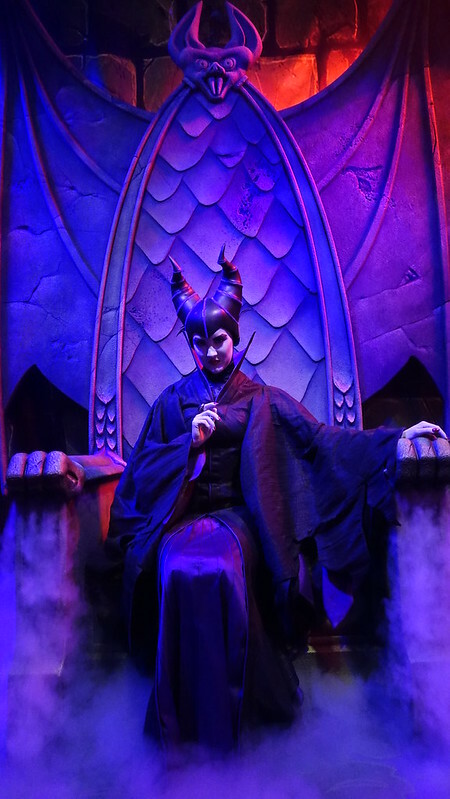 Guests joining us at the table were there primarily to meet Maleficent because she is so difficult to find at Walt Disney World for meet and greets. 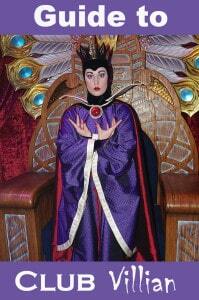 Soon, she’ll be removed from the Castle show as well, meaning you’ll only see her at the Boo to You Parade. 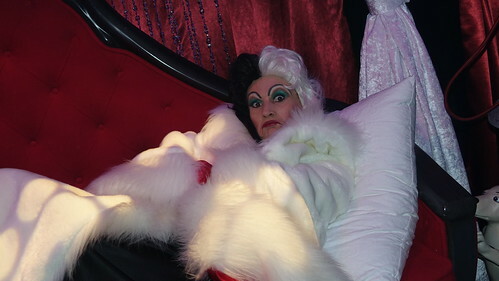 Cruella was a lot of fun. She always has a whacky side and loves to talk about dogs, especially her addiction to dogs. Queen with many names never smiles. It causes wrinkles and she needs the mirror to tell her that she is the “fairest of them all” one day. Seems a little self obsessed to me. 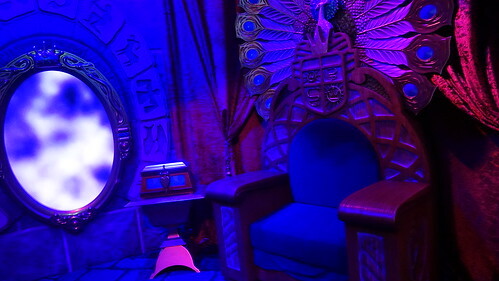 I love this photo, as it shows her in her true form and you can catch some of the amazing detail in her peacock throne. 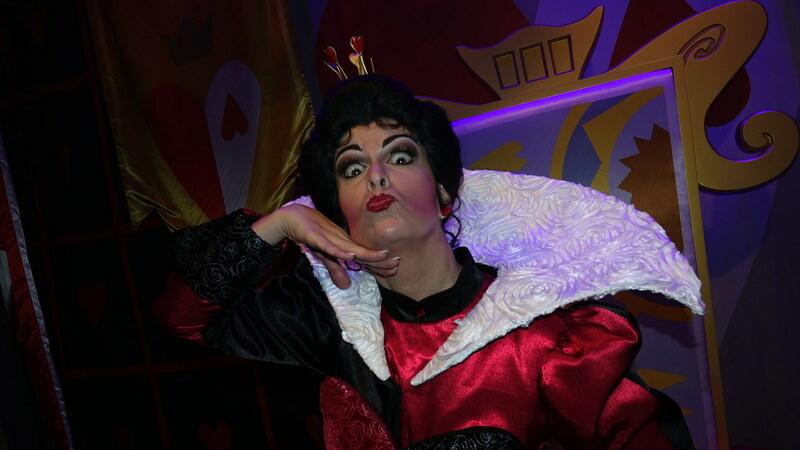 Queen of Hearts was awesome. She was very into her character and loved making crazy poses. After Debbie had her photo I asked to join, as I usually do and she sent Debbie away so we could have our special moment. I told her I’m a big fan of croquet and she said I’d never defeat her. Game on Queenie! We finished off the meet and greets with a big smile. We had a terrific time. Food was good and plentiful. Other than the sound snafu, the entertainment was good. Debbie enjoyed doing the “Whip and Nae Nae” or whatever it’s called with the DJ and host and a hundred strangers. Don’t forget to share, so others can enjoy! Do you have any ideas on why they closed this? It seems to me everyone loved it. 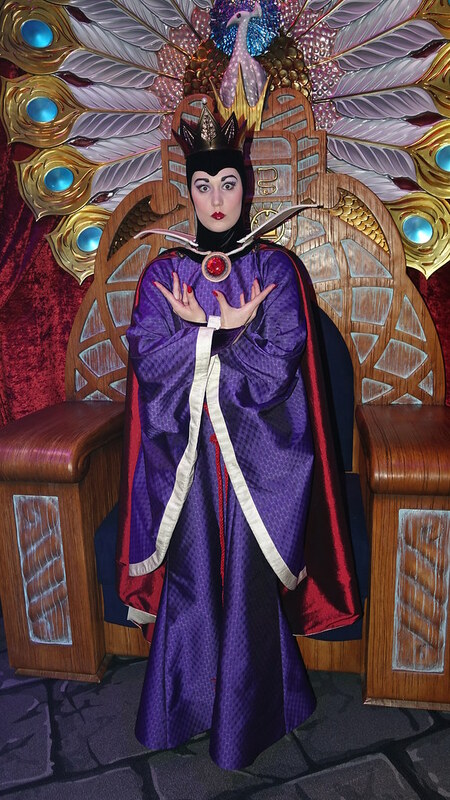 The price being a bit steep is easily justified by the fact that you can rarely meet villains at Disney. It’s a shame really. I am aware of that. I do not remove pages as the offering could always return in the future. 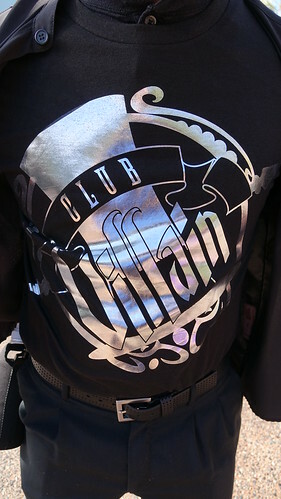 I am not seeing Club Villain on the Disney Web site have they done away with it? Do you also pay separate park admission in addition to the $129 for the event? 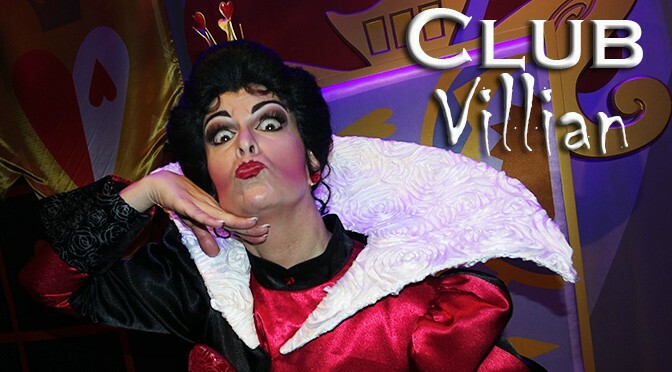 Club Villain or a second night at Mickey’s Very Merry Christmas party? Or I suppose we could try to do the early Club Villain and get over to the magic kingdom but that seems a bit much…Limiting factor is more time than money. We’ve never done either. 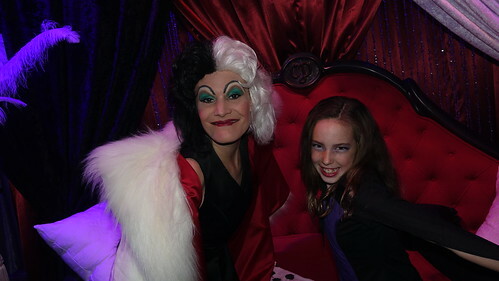 We have gotten villain pictures in the past at the Halloween party. 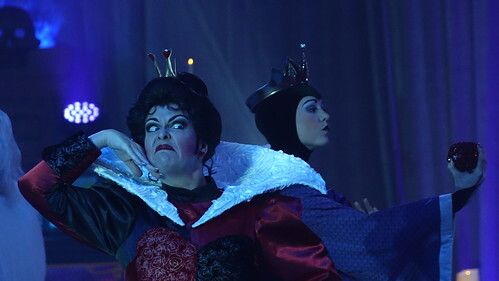 Villains are generally a favorite but I’m trying to figure out if this is a unique enough experience to go for over definitely hitting everything at the party (not actually trying to hit every character at the party but definitely want to hit Scrooge, Santa Goofy, and Santa Claws). Thanks for any insight! 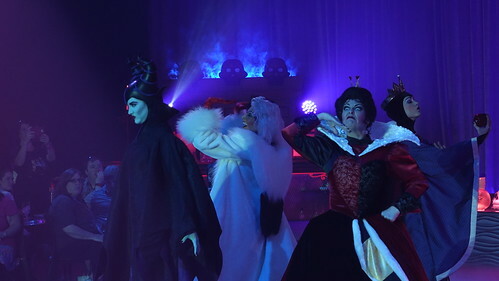 4 Villain ladies vs Nick & Judy, Sandy Claws, Scrooge and others. Santa Goofy will be at Animal Kingdom beginning next week. Party is less expensive too. Hi Kenny, we have a 2 1/2 year old and a 4 1/2 year old..do you think this is too scary? Any more information on if they sign autographs this year? Oct. 2016 Thanks! That would depend upon your kids. 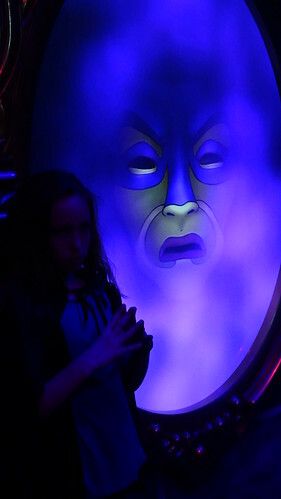 We didn’t find it overly scary, but some kids may not like the darker environment and villains. They do sign. I haven’t gotten a solid answer for this ?? Do the guests dress up in costumes for the event?? What kind of attire do you suggest for this event? I have reservations on Oct 1 for the 8:30pm Club Villian. Hollywood Studios closes at 8 that night. How will resort transportation work for us? Will it even still be running????? They will make sure you get back to your resort. How early should we get there? Are these times listed for when the party starts or when we can come in? Where you able to take pictures before the party or after? Kenny, do you think Character Palooza could be done if we have 5:15 pm reservations to Club Villain? I wasn’t quite sure the how long it would take us to get there from location of Palooza. Thanks for any insight. This will be on a Saturday, Sept. 17th, btw. Sorry I neglected that info! Hi Kenny! I love your review and your daughter’s cape! I have a question for ya, if you don’t mind :) I bought tickets today for the September 9th 8:30 PM show. Do you know how the seating is determined? Is it determined by who booked first or just randomly? Thanks so much for your help!! 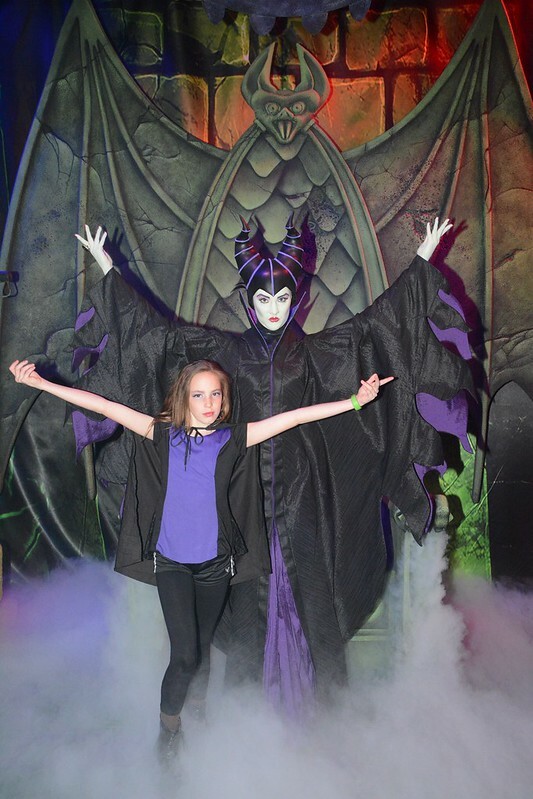 We are also considering getting tickets for September 9th, but it’s my 11 year old niece’s first trip to Disney, and I don’t want to have to skip Fantasmic. Any word on if they will be adding a 2nd showing since they have just extended the hours? Hi Kenny! Great photos and review! They are offering two shows during my late Oct. stay 5:15pm & 8:30. If I choose the 5:15 will I have time to see Fantasmic! and the Star Wars Galactic Fireworks? Thank you. Your review and photos made this an easy purchase. We’re really looking forward to it! No chicken fingers or stuff like that. 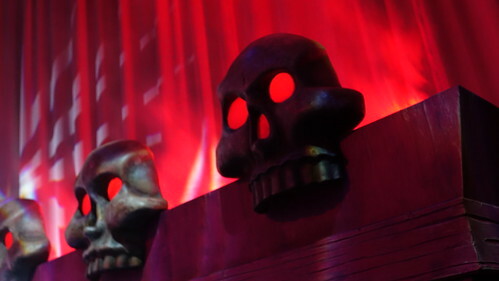 Do you think this will return in the fall around the Halloween Party schedule? I am visiting last week in October and would love to go! FANTASTIC Special Event!! 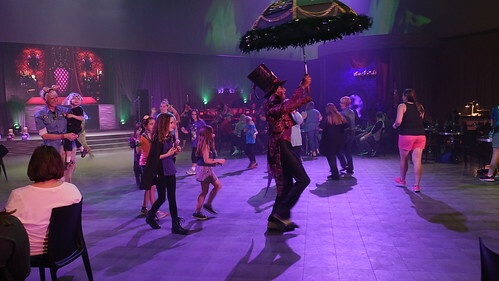 My family of 5 attended the March 15th event and was blown away by the entertainment, food and villain interactions. KtP described everything so well. 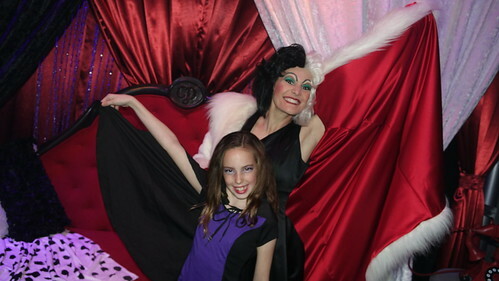 Cruella was the most “fun” dancing and posing, followed by Queen of Hearts. 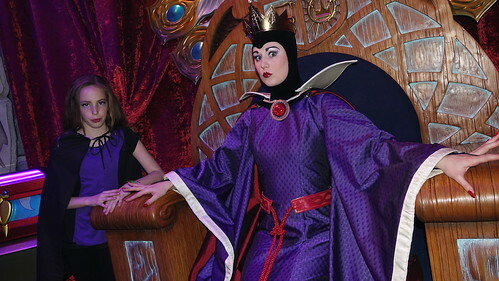 Maleficent and Queen Grimhilde were so regal. The initial $129 per person sticker shock was softened a bit with an Annual Passholder /DVC discount to $99 (thanks KtP for the heads up) but even the higher price would have been worth it. 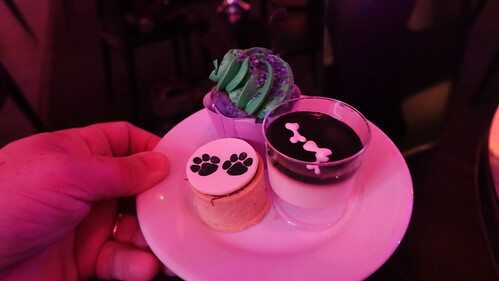 In comparison, Club Villian was just a bit more than our Le Cellier steak dinner with wine, dessert and tip. I am hoping they do this in late September also. Yes, there is a restroom inside the building. Not sure if it had a companion one though. Thank you for that much at least! I’ll keep my fingers crossed! The meet and greet areas are stunning! I would LOVE to be able to do this. Sadly, we too are a family of 5 and just don’t think we could swing that on top of all the other expenses. :( Looks super fun though. Thanks for sharing all those pictures. It looks cool but there is no way I would ever spend that much money. That is just like the dessert parties that are way overpriced. I have 3 kids so with 5 of us it would be about 700.00 with tax, That’s crazy! I love Disney but I think I will stick to free meet and greets. Why is Club Disney not being offered right now? We had a great time. I’ve paid more for a football game that lasted a similar length of time. I’d like it better at a lower rate, but it’s supply and demand. 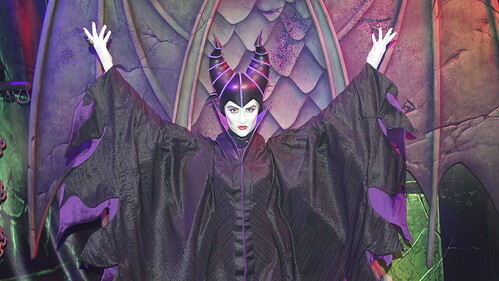 It is sad to hear that Maleficent is becoming more and more hard to access, especially with the replacement of “Dream Along With Mickey” on the way. =( Hopefully, they ramp up the Halloween parties to make the villains more accessible (as opposed to last year). 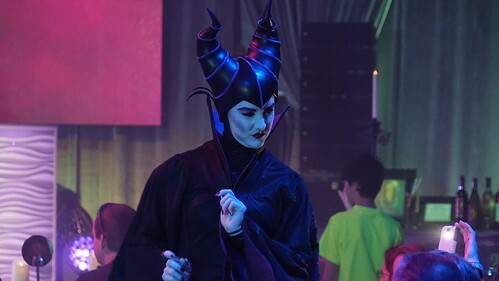 Oh, sorry I meant at WDW/MK’s MNSSHP last year, not Disneyland’s Halloween Party, which provided excellent opportunities for Maleficent, Hades, Jafar, Ratcliffe, Grimhilde, and Cruella in Town Square (as you of course detailed in your report). 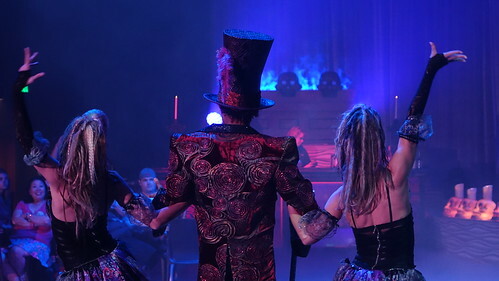 Kenny, I saw you at club villain and saw debbie dancing behind Dr. Facilier. Also, they all signed including Dr. Facilier. 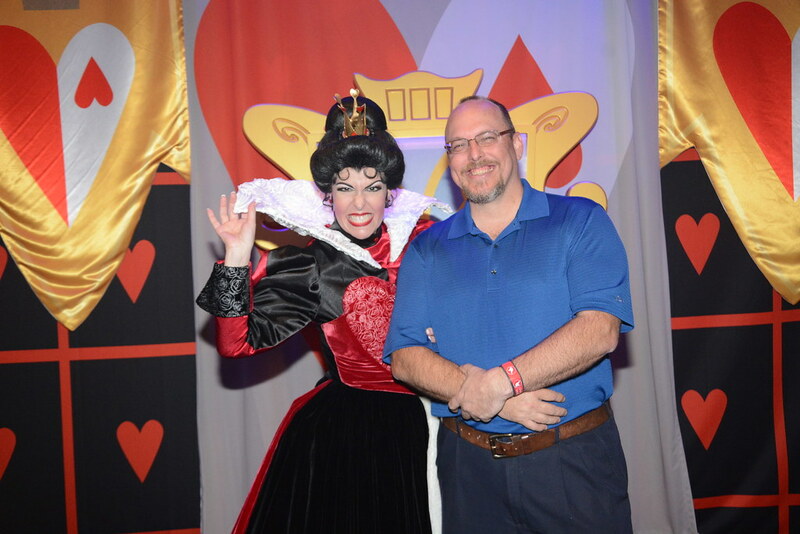 I find it unfortunate that Disney continues squeezing paid guests for more cash to meet characters. If this is successful how long before that’s the only way to meet a princess as well? I understand this is a for profit business but it seems this is taking it to an extreme. Do they sign items as well or just the presigned invite? Don’t sign autographs, that’s why you get the pre-printed thing. When I was there in Jan 16th they were signing autographs. All of them but Dr. Facilier, signed my daughter’s book. We asked and they signed. A CM said “no” for you? We were told by one that the villains wouldn’t sign, so we didn’t bother asking each villain. No big deal to us as we’ve had them sign many times. So no Memory maker is required? Photos are included? Yes, answered that at top. Kenny I just left club villain and they said photos are not complimentary? Did they change this? First time I’ve heard they are charging for the photos. Should be included with the cost of the event and in your Photopass account. So hoping they continue this. I really want to go on April 30th- just before my full day in Hollywood with Kenny!! !